Once upon a time there was a volunteer. They were full of good will, a zest for life and a desire to travel, and wanted more than anything to be able to do something meaningful in their gap-year: to give something back. One day, they went to an assembly held at their school and soon were inundated with options: volunteering in an orphanage in Thailand; teaching English to students in Cambodia; working with street children in Tanzania. What would they gain? A challenging month helping a local community that would look great on the CV/Resume. Qualifications needed? “Good will, a zest for life and a desire to travel.” Bingo! They’re off! And so the story goes. The global boom in volunteering over the past ten years has impacted young people across the world; with corporations selling volunteer-travel packages directly into schools. Throughout the western world, organizations are working closely with schools, delivering lectures, workshops and promotions to advertise the myriad ways that students can channel their “good will” with their desire to travel – and it is fast becoming the norm to have a program partnership offering international voluntourism packages within a school, college, or university. However, although companies are going into schools to educate about the “good bits” of volunteering, they often do not support student learning about the bad, nor help them to make ethical, critically assessed choices. How are we teaching Global Citizenship? In schools, colleges, and universities across the world, we are educating our young minds to become global citizens, encouraging good will, a zest for life and a desire to travel and to grow in the world. We are actively encouraging voluntary service – it is fast becoming an expectation on a CV or resume. However, we are not yet (for some reason) teaching our students how to carefully choose their voluntary service; nor about the importance of choosing ethically, sustainably and critically. Voluntourism is not always a good thing; in fact it is fairly often a very bad thing for communities impacted (most significantly for vulnerable children in orphanages). However with the industry primarily set up as profit first, people second, local communities last, it is not surprising that the most damage is happening within the communities receiving the volunteers. We are not educating our young people to make the right volunteer choices, but are instead simply blaming them when they make the wrong ones. What will I be doing in my placement? Am I actually qualified to do this? If not, should I then be doing this? Will I receive training? If not, why not? Is my organization working with a partner organization on the ground? If so, are they actually in need of my help? If I am paying, where is this money going and what am I paying for? Am I encouraging profiteering from poverty? Is the organization ethical? Are they supporting local community employment and local needs first? Is this a bottom-up project, asked for by the community? One of the most crucial educational tools that we need to encourage in young people is the importance of critical thinking. Asking questions allows the volunteer to understand just what, why and how the project is working and whether they really are going to be doing something good for the community they are entering into, rather than just for themselves. Thinking beyond the self is a vital tool encouraging empathy building. Although the very notion of volunteering is the act of caring for and giving to others, it can also fast become a self-serving venture if we are not trying to understand the impact onto those we serve. Encouraging young people to put themselves into the shoes of the local community and think about the impact from that angle is a vital tool to teach. For example, it may seem that working in an orphanage is a wholly positive experience on the surface, yet by drawing back the curtain and learning about the impact of the volunteer experience upon the vulnerable children within these care homes, it soon becomes apparent just how emotionally damaging this sort of volunteering can be. Unlearning assumptions and stereotypes is also crucial to ensure an ethical, positive volunteering role. The criticism of the “white saviour” complex, or profiting from poverty is often justified in many cases of overseas volunteering, primarily because of the stereotypes and assumptions about development aid that are being taken with the volunteers. Understanding that aid can be both positive and negative is a hard but vital lesson to learn; as is the understanding that aid can so often patronize, reduce or disempower; thus unlearning is a vital tool for students to practice. How are educators starting to support this? There are a growing number of education projects on the ground working with schools to support positive, ethical volunteering. Research by Globalsl.org has been collated in a database of Top 50 Global Learning Education Resource List, all supporting ethical global citizenship and positive global learning. ThoughtBox is an online education curriculum for schools encouraging critical thinking, empathy and unlearning. Covering the topic of Voluntourism within a bespoke curriculum, ThoughtBox also works with teachers and students within a range of other global issues; allowing the core skills of “think, feel, and unlearn” to be practiced by students to support positive, ethical global citizenship. Bright Green Enterprise offers workshops to UK schools supporting an understanding of ethical volunteering and grass-roots development; learning about some of the negatives that come with international aid and supporting positive choice and ethical, sustainable practice. 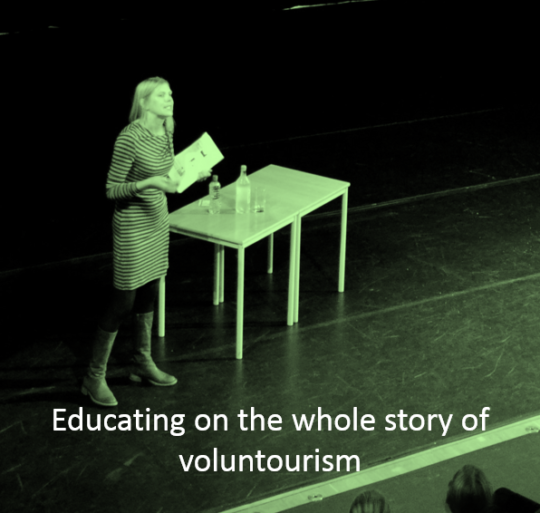 Individuals such as Chloe Sanguinetti and Daniela Pappi who have learned first-hand the potential for negative impact in volunteering are working in schools to offer lectures and seminars, sharing their experience and supporting a re-thinking culture when it comes to Voluntourism. At the university level, a growing network of higher education institutions and nongovernmental organizations hosts the International Service-Learning Summit every 18 months. The next summit will take place October 23 – 25, and will critically consider ethical partnerships for global learning and cooperative development. Good intentions are no longer good enough when it comes to volunteering and we owe our young people a rounded and critical education in learning the whole story: the good, the bad, and the ugly – of what it means to be a volunteer. Orphanage Tourism: What can you do to help? Sharing this post on the hashtag #StopOrphanTrips. If you are an educator, exploring the resources mentioned and educating your students in the whole story of volunteering.